Perishable products such as fruit and vegetables are still metabolising once picked. This means that the Oxygen (O₂) in the atmosphere is being consumed and producing heat, Carbon Dioxide (CO₂), moisture and possibly ethylene gas. The vegetation is ripening and will eventually degrade to an undesirable state. As a result, shipping and storing perishable food can be a challenge to ensure the product’s integrity whilst in transit. There are 4 extremely important factors to consider when transporting perishable foods – quality, temperature, relative humidity and gas concentration; Quality – Fruit and vegetables need to be of good initial quality; Temperature – Each 10⁰C reduction halves the rate of metabolism; Relative Humidity – Just 2% loss of water is extremely detrimental to quality; Controlled Atmosphere – Reduction of oxygen concentration from 21% to 2% results in approximately a 30% reduction in metabolism. Where properly used, the controlled or modified atmospheres can considerably increase the storage life of certain fruit and vegetable cargoes. Slowing down their metabolic rate delays the natural ripening of the produce without affecting its flavour and eating quality. 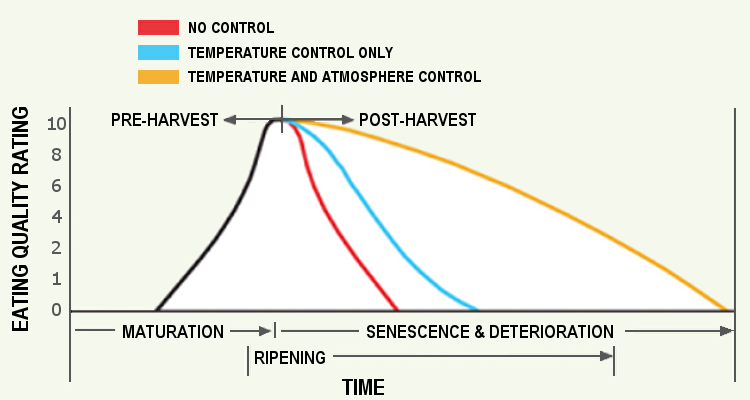 The graph illustrates the effect of adding in a control atmosphere system. One of the controlled elements in the storage space is a reduction in O₂. 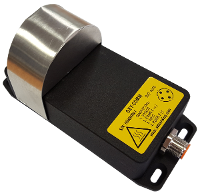 SST’s OXY-COMM Oxygen Sensor is designed to prolong the life of perishable food within refrigerated, controlled and modified atmospheres by accurately measuring the oxygen concentration. The OXY-COMM Oxygen Analyser combines a high accuracy zirconium dioxide oxygen sensor with a networkable, fault tolerant RS485 interface. The oxygen sensor element of the OXY-COMM is mounted under a corrosion resistant aluminium hood to protect it from the environment. The IP66 waterproof die-cast aluminium housing accommodates the electronics and has a 4-pole M12 connector to allow multiple devices to be interconnected. Unlike other technologies, zirconium dioxide oxygen sensors benefit from a long operating life is due to the non-depleting sensor cell technology. No reference gas is required and, when needed, simple, single point calibration can be performed in fresh air (20.7% O₂) or in any other known O₂ concentration. Their ability to function in extreme temperatures from -100 to 250⁰C and harsh environments, results in a rugged, robust and reliable sensor that is RoHS compliant. SST Sensing’ engineers offer complete application and technical support and will work with you to produce a product that meets your specification exactly. For more information on our OXY-COMM Oxygen Analyser, please Ask the Expert!